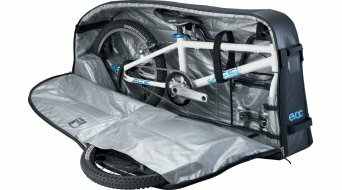 If it is about transport opportunities on the bike, there are different variants in regard to the bike bag to discover. From the smallest saddle bag to the largest double pannier bag or courier bag, our shop offers you a large selection at favourable prices. There are large variants, such as pannier bags, rear panniers or front panniers. In this case, the Ortlieb bags have an especially good reputation. 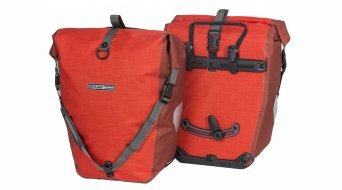 Ortlieb became known for having made the bike bag waterproof and this is what they have been popular for since. After all, this is an important feature when you start a bike trip or longer bike tours - since then, wet luggage is for sure the last thing that you could use. A smaller storage possibility is provided by saddle bags, which generally are equipped with spare tube and tools for possible breakdowns. Bags for the top tubes, handlebar bags or triangle bags are of medium size. They can prove very space saving by being fastened in the frame triangle. Tip: By the way, you also have to pay attention to the fastening systems of bike bags. Here, you'll find some systems which will prove to be practical in the daily use, such as the Klickfix or the Quick-Lock system. You would like to transport your beloved bike, for example to take it with you on the plane to your holiday destination? Then you'll surely be faced with the decision to buy a practical bike case. 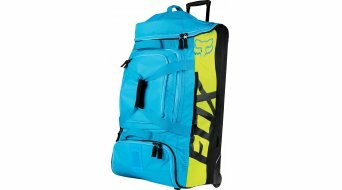 On the one hand, there are soft bike bags, which protect your bike quite well with good cushioning and organised interior or the rigid variant, the hard shell case for bicycles. For sure, such a case for the bike first of all is an investment, but if you travel much and you like to travel with your bike and need to safely stow it away (whether in a car, in the train or on the plane), you should not cut corners. If your bike is that important to you that it accompanies you on your travel, then the protection of your bicycle during transport should also be important accordingly. Wheels can also be particularly secured in a practical way in wheel bags, which are available in such a multitude, that they also have received their own category here in the shop. Wheels are sensitive, just think about the spokes, thus they are worth the effort to buy a bag for them should you wish to pack them separately from the bike itself. Helmet bags are also very practical for the transport to the holiday destination or the trip to the nearest bike park. It is selfexplanatory that the helmet is not supposed to (on the head als well as during transportation) be exposed to impacts and get damaged as a result thereof. Since that is what the helmet should exclusively fulfill when it protects you during a fall. Transport bags on the bike are the one thing, the other are bags for transportation of your bike, and then there are also the bags for yourself: A cool sports bags for the fitness studio, the leisure time or the bike trip, for those, we also have the fitting selection for you! You arrive at the bike hotel and first of all, you park your cool travel bag from Oakley, EVOC, Fox or Specialized in the foyer... Beautiful thought, don't you think so? Whether for the gym, swimming pool or travel - the perfect sports and travel bag for yourself can be found here in our shop. From small to large, in different sizes. We also offer a large selection for fans of courier bags, e.g. from Ortlieb or Vaude. A courier bag is typically worn as a cross-over shoulder bag and recalls the "urban" bike style for many. Classically also known as "messenger bag", the cross-over shoulder bag used to be always carried by courier drivers and still finds fans nowadays. It is a practical and safe way to safely carry documents to the office. The bum bags can also be slung on, but in a smaller format for the hip. Such a bag is suitable for the smaller jogging round or a trip with the bike. It is perfect for carrying small things, such as keys, purse, mobile phone, Ipod or tube. For an additional drink solution, there are special water belts, such as e.g. the Deuter Pulse models; they provide you with water - always handy - on your next walking round.